Heroin overdose is a frequent tragedy within our society and heroin overdose accounts for many preventable deaths in the United States. Depending on the purity of the heroin and the users tolerance, a lethal dose of heroin may range from 200mg to 500mg, but tolerant long term addicts have survived doses of 1800mg and over. However, because of the inconsistencies with street heroin there is no absolutely specific "safe dose amount". It depends on tolerance, amount taken and purity. It is very easy and common for a heroin addict to take more than they intend to because they can never be sure exactly how pure or how strong the heroin is that they are taking, leading to serious problems like unconsciousness, seizures, heart attacks, strokes, brain damage and even death. Because heroin purity can vary tremendously, a heroin addict that takes the same dose for months or even years can overdose without changing any part of their routine, and new addicts can suffer from a heroin overdose after consuming or injecting even the smallest amount of heroin. Additionally, heroin is often “cut” or diluted with other substances such as sugar, starch, quinine, strychnine, or other poisons for the purpose of increasing profits. These additives may induce other potential dangers. Because of the unknown strength and actual contents of the heroin they are taking, users are at a great risk of heroin overdose and death. Making and selling illegal drugs is not a precise science. Often drugs from the same dealer and batch have varying strengths. The active ingredient is not necessarily evenly mixed in. Even experienced users can be caught by a different level of purity in a sample and accidentally suffer a heroin overdose. 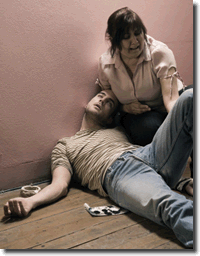 When a person falls victim to heroin overdose, they usually become unconscious and cannot be roused. Skin will become cold, moist, and bluish with possible blue lips and fingernails, discolored tongue and dry mouth. Heroin overdose victims can easily pass out or slip into a coma or die without anyone even noticing. If the overdose victim is still somewhat conscious, they will often then experience disorientation and delirium, muscle spasms, and severe stomach cramps. Early detection signs of heroin overdose are; very slurred speech, unconsciousness and unresponsive, slow shallow breathing, and lips turning blue. 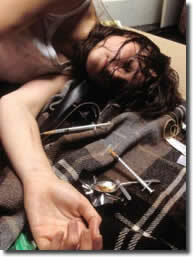 Heroin overdose can happen very quickly within several minutes or slowly over several hours depending on the situation. Heroin depresses the area in the brain that controls breathing function. During a heroin overdose, breathing slows down tremendously or may actually stop altogether. Risk of heroin overdose increases dramatically when heroin is combined with other depressant drugs like alcohol or benzodiazepines like Valium or Xanax. Although there are heroin overdose cases where a single high IV dose of heroin has caused immediate death, it actually more often occurs as a prolonged process of breathing becoming increasingly slower, the brain becoming damaged through lack of oxygen, and eventually the person dying. This means that the person can generally be helped if they receive assistance in time. 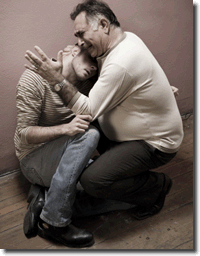 In fact, at least 80% of fatal heroin overdose deaths occur because the person was alone when they used the heroin. If help is received in time, a heroin overdose can be counter-acted using an opioid antagonist medication, such as naloxone (Narcan). This reverses the effects heroin has on respiratory depression, sedation and brings the person back to consciousness, however, in physically dependent heroin addicts, it will also put the person into immediate heroin withdrawal producing painful withdrawal symptoms. Unfortunately, not everyone can obtain help in time, or often they do not realize that help is needed. In these cases, many people needlessly suffer and die from heroin overdose, in situations that could have been prevented. The unknown purity of the drug. 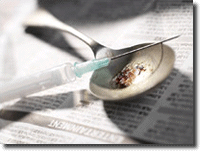 Ironically, many heroin overdoses are due to increases in the quality of the drug sold on the street. Injecting heroin intravenously, because the drug reaches the brain more rapidly than other methods of taking the drug, and because the dose is taken all at once. 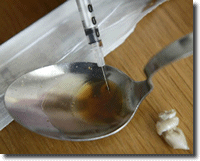 Combining heroin with other sedating drugs such as alcohol, benzodiazepines, and methadone. A heroin overdose, even if not deadly, can have long-term physical and mental effects. If the brain is deprived of oxygen for any length of time, brain damage can occur. Chronic pulmonary or heart complications may also develop. Liver disease and viruses or infection can take up permanent residence in the blood or organs. Other drugs in combination with heroin can also bring about long-term psychosis and create fundamental changes in brain function that are irreversible. One of the greatest risks of being a heroin addict is death from heroin overdose. Each year about one percent of all heroin addicts in the United States die from heroin overdose despite having developed huge tolerances to the effects of the drug. 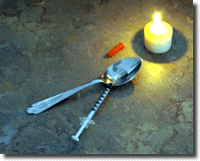 If you are using heroin, don't let yourself become a statistic and get help immediately.